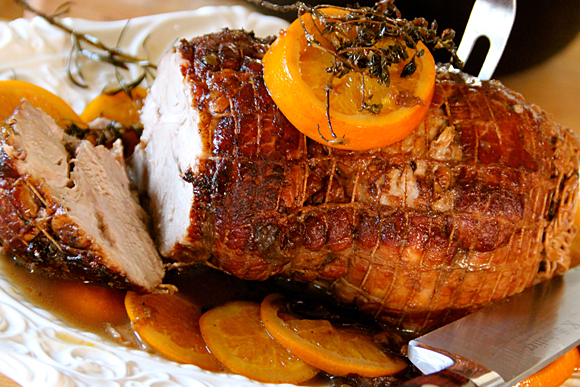 The glaze that accompanies this Roast is also delicious with pork chops or chicken. Place on rack in roasting pan; roast at 160°C (325' F) for 2 hours. Combine remaining ingredients in small saucepan; heat stirring constantly until mixture thickens and bubbles. Brush over pork. Continue roasting, brushing occasionally with glaze until meat thermometer reads 80°C (170°F) .or about 1 hour longer. Heat remaining glaze; serve as sauce with sliced pork.